Had an interesting debate while in India recently about the religious make-up of the country. 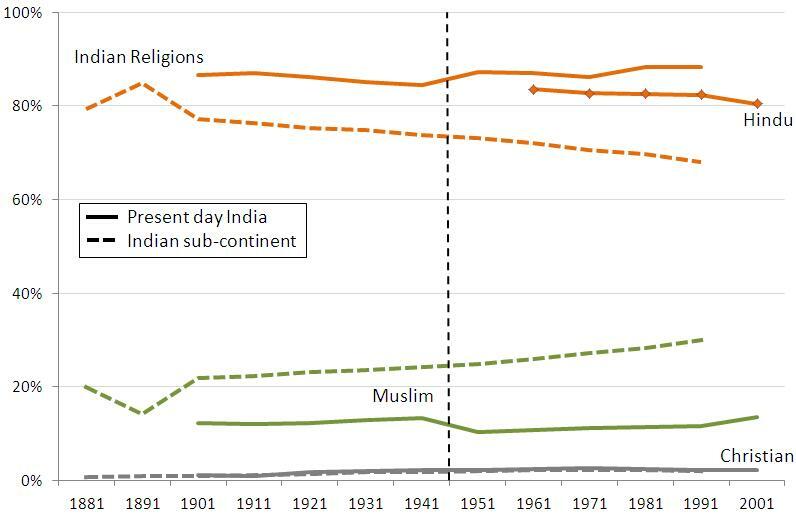 Some people were suggesting that since partition (1947) the proportion of Muslims in modern day India had gone from 3% of the total population to around 20%, and that Hinduism is on the decline. The rebottle is that the numbers have actually gone up quite astoundingly, and the drop is more serious after partition when Pakistan and India were separated. Ok, let’s have a look at the data then. 1. Look at the shares across the whole sub-continent after partition. The split is 73/25 in 1951 and 68/30 by 1991. But this is now looking at India, Pakistan and Bangladesh in total – countries with very different growth rates, both for GDP and Population. 2. Look at the shares in modern day India. The split here is 87/10 in 1951 and 88/12 by 1991. Looking just at Hindu’s, you’d get 84/11 in 1961 and 80/13 by 2001. However you flip and turn this data, not a whole lot happens. 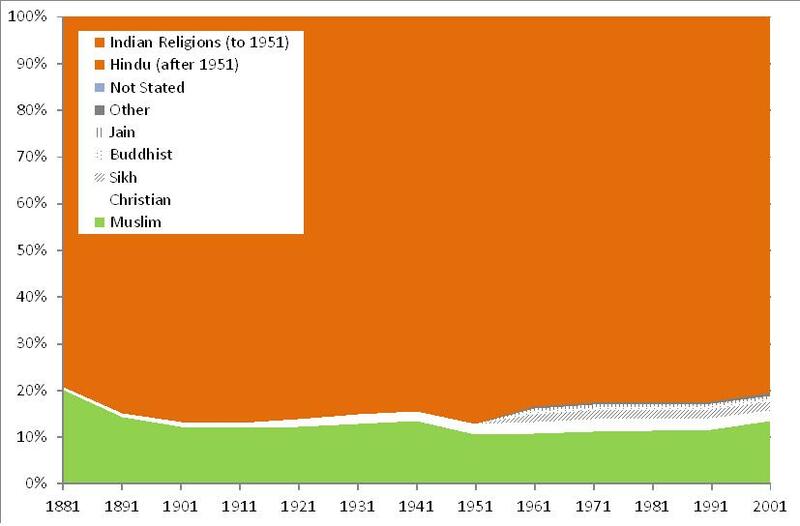 There’s a slight change following partition, Indian religions add 3% to their share, while the Muslim proportion drops by the same. One could get excited about the sub-continental demographic change, but that has little bearing on India as a country, and equally the proportion of each religion is relatively constant over this long time period, although other religions are making inroads.